I am three reviews behind on books I’ve read. I’ve got another book that I am trying to wrap up before it’s due back at the library later this week (only 300-some pages to go!). I have a freelance editing project that needs to be done sometime this month. So of course I’m not going to do any of those things right now. 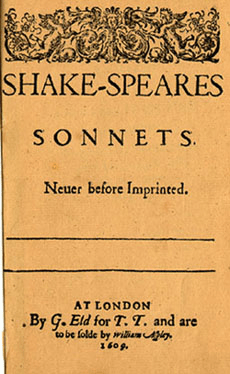 No, right now I’m going to tell you a bit instead about one of the most fun books-related things I’ve ever done: participating in a tutored read of Shakespeare’s The Sonnets. A tutored read is an invention of the smart folks in the 75-Book Challenge over at LibraryThing, my favorite place to catalog my books, track my reading and talk to other folks who love books and reading as much as I do. The idea was born last year when one of the group members proclaimed she had never read a Jane Austen novel, never intended to, and couldn’t stand reading books written in the 19th century in general. Well! It didn’t take long for someone else, who has a deep love and appreciation for 19th century literature, to offer to provide moral and logistical support for a read of Austen’s Emma. The details were worked out as they went along, but it generally consists of the tutee reading a chapter (or however much of the book as they like) and then posting all of the questions that occurred to them as they read. The questions might relate to plot points, unfamiliar or archaic vocabulary, or the social/cultural context of the book’s time period. Other group members are welcome to follow along and occasionally chime in with a comment here and there, but the primary posting is done by the tutee and the tutor, at a pace that works for the tutee. That first tutored read of Emma turned out to be such a hit that it was decided to make this a feature of the 75-Book Challenge group. A combination of wiki and group threads helps match folks with expertise in particular areas (time periods, or authors, or genres) with prospective tutees. I knew that I wanted to participate in some way, and finally hit on the idea of asking for help reading Shakespeare’s sonnets, which I’ve had a copy of for years and never cracked open. It wasn’t long before another group member offered to be my tutor, and we were off! The sonnets seem to be a particularly good choice for a tutored read. They are pre-segmented pieces of writing, so we’ve hit on the pattern of posting and commenting on one sonnet more or less every day. They are in the public domain and short, so I can post the entire sonnet at the beginning of my post each day, followed by my thoughts about what I think the sonnet might mean, or asking any questions about imagery, vocabulary, or (especially!) what my tutor calls “pretzeled syntax,” a particular favorite of Mr. Shakespeare. I never took any poetry appreciation courses in high school or college, and I’ve always felt intimidated by trying to read serious poetry, so the support has been great in helping to grow my confidence and really appreciate the text. I don’t think the tutor and tutee have to have similar senses of humor, but in my case one of the most appealing things about my sonnet reading is the rapport I’ve developed with Cynara, the tutor who has made me laugh and say “Ah-ha!” in nearly equal measure. Our thread has gotten downright silly at times, and it’s all helped to make the sonnets seem very accessible and fun instead of boring and impenetrable. If you’d like to take a peek at what I’ve been up to, you can follow along with the first thread (which covers Sonnets 1-24) over on LibraryThing. You don’t have to sign up for anything in order to read the posts, but if you like what you see and would like to comment, signing up is as easy as choosing a screen name and a password (offering up your email is optional, so you can be just as anonymous as you want to be). If you stop by, please let me know you’re there, so I can say ‘hi’!